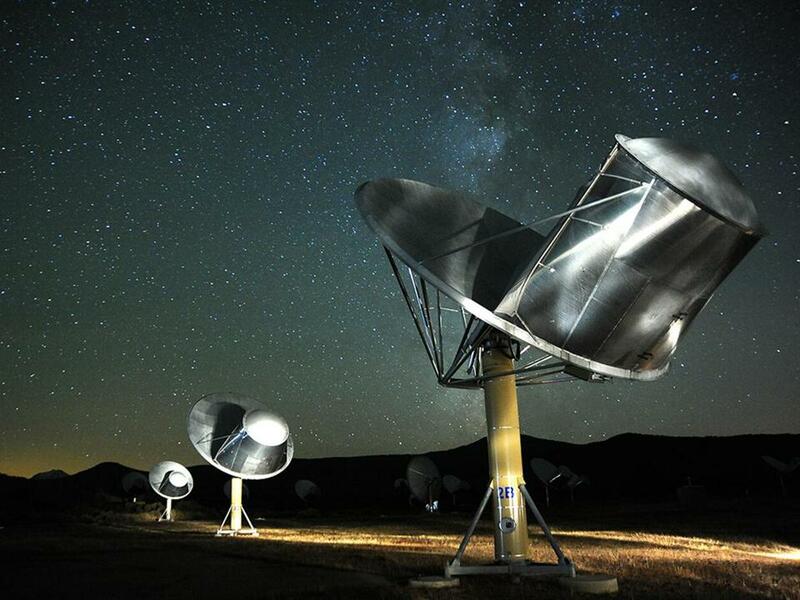 SETI uses the Allen Telescope Array in Northern California to scan the skies for signs of intelligence. It’s not too hard to tell that Earth has intelligent life. We have been broadcasting signals from our radios and radars for about a century, which seep out into space and betray the presence of our technological civilization. This electromagnetic leakage has diminished somewhat with the advent of digital technologies like fiber optic cables, but the bright lights of our major cities give further evidence of our activities that could be detected afar with a telescope. A distant observer equipped with a spectrometer, and loads of patience, could even watch global environmental events unfold, such as the depletion and replenishment of our ozone layer or the rapid increase in greenhouse gas levels. If anyone is out there, and if they are looking, then they should already know we are here. Communicating with another civilization on a distant planet is an idea that has terrifying implications and tremendous potential. It raises questions about how we should shout out into space, what we should say, how we should say it, and what we might do if we receive an answer. Astronomer Frank Drake is one of the pioneers of the search for extraterrestrial intelligence, or SETI, who led the charge in 1960 with Project Ozma. This first SETI experiment attempted to observe radio signals around two nearby stars, searching for evidence of transmissions from any potential inhabitants. Drake and his colleagues reasoned that any nearby planets populated by intelligent beings may, like us, be emitting unintentional leakage radiation as a byproduct of technology. They also speculated that advanced societies might be broadcasting intentional signals in order to be discovered. Project Ozma failed to find evidence of such a radio beacon within its limits of detection, but Drake’s optimism and dedication have sustained nearly 60 years of effort worldwide at scanning the skies for signs of intelligence. Drake is also responsible for the first attempt at sending messages to extraterrestrial intelligence, or METI. With help from Carl Sagan and others, the Arecibo message was written and transmitted in 1974 toward a globular cluster of stars about 25,000 light-years away. The vast distance makes hope for a reply seem bleak, but the longer-lasting contribution of the Arecibo message is the concept of attempted communication with an unknown form of intelligent life. What would we say to an alien, knowing that our set of common experiences is extremely limited? Drake and colleagues developed a graphical message that depicted the solar system, a DNA structure, a figure of a human, and other elements intended to be comprehensible without prior knowledge. The particular design is somewhat biased toward beings capable of visualization, but this first attempt at METI has also spurred decades of research into the methods of interstellar communication. Deciding what to say is the easy part if we assume that other forms of life will experience the same basic laws of physics as us. Following this logic, mathematician Hans Freudenthal constructed the Lincos language in 1960 as a way of encapsulating humanity’s knowledge in terms of fundamental physical and mathematical principles. Lincos is designed so that any reader familiar with principles of logic, mathematics, and physics should be able to deduce the syntax and learn to converse without knowing the language at all. Lincos itself has mostly remained a theoretical exercise that showed mixed results with students, but this initial comprehensive language has inspired a handful of modern computational grammars suitable for interstellar message composition. The range of ideas we can express with such a language restricts us to mathematics, science, engineering, and other concepts that can be reduced to quantifiable terms; abstract feelings like love, wonder, and loneliness would be impossible to convey using algorithms or mathematics. Yet without any more common frame of reference than the knowledge that we all inhabit the same universe, the family of languages inspired by Lincos are the best candidates for actually communicating with extraterrestrial intelligence. Astronomers proposes a rewrite of guidelines for what to do after contact. Deciding to actively transmit is a more contentious and politically charged move. Critics of METI include scientists, authors, and politicians who fear the potential harm that could befall Earth from malevolent extraterrestrial beings. Any civilization with the capability of receiving our faint signals must be at least as advanced as we are; and if they have the fortitude to send a response or to come and visit, then their capabilities will far exceed our own. Critics prefer a strategy of passive listening over active transmission, arguing by analogy that one should not carelessly “shout in the jungle” for fear of drawing predators. Physicist Stephen Hawking famously expressed this concern that deliberate transmissions could expose Earth to predation, enslavement, or destruction by dangerous extraterrestrial beings, urging that we should wait “until we have evolved” further before making ourselves known. Yet space is no jungle. A jungle is a densely forested area thriving with life, but, so far as we know, the rest of our solar system is lifeless, and almost 60 years of SETI research has returned only null results. The tools of astronomy allow us to peer far into the vast and isolating expanse of space around us, with little to impede our view in any direction, and continuous astronomical surveys provide confidence that we will notice anything unusual headed our direction. Rather than a jungle fraught with danger, the barren landscape of a desert wasteland provides a better analogy for understanding our cosmic environment. We are already making plenty of detectable noise with the leakage emanating from Earth, so any observers with keen senses should have already noticed us. Reaching us from their distant vantage point presents a greater challenge, given the immense separation between stars. Although we cannot pretend to know the motives of extraterrestrial beings, we can probably assume that any civilization capable of traveling interstellar distances must surely have also figured out how to feed themselves along the way and provide any other basic needs. If we do meet anyone else in the desert of space, then they will, by necessity, also have mastered their own means of survival. We can worry, as the METI critics maintain, that extraterrestrial beings may choose to destroy us or plunder Earth’s resources for other reasons. Perhaps humans would provide amusement to our extraterrestrial captors for performing trivial tricks (similar to the use of performance animals in sea parks), or perhaps certain resources on Earth would be considered precious or a delicacy by extraterrestrial consumers. Yet even with wild possibilities such as this, an advanced civilization with the ability to travel between stars and withstand self-destructive tendencies has also probably been around for a long time, by galactic standards. This type of advanced society could have colonized the galaxy many times over by now, so there is no reason to think that, if it desired, it would not have already plundered or destroyed Earth long ago. We can also remain hopeful that contact with other intelligent beings will provide benefits for our own survival. Carl Sagan’s optimism about SETI led him to envision the possibility of a message received from extraterrestrial beings containing technological advancements that would radically alter our civilization. More mundane discourse about basic mathematics or physics seems like a more plausible outcome for a successful METI experiment, which still would provide us with knowledge from literally another world. The greatest transformative potential of METI for our civilization would be simply the realization that we are not alone, and the ability to continue the conversation would be a far greater discovery than to remain silent in passive listening only. Thinking about METI can provide us with benefits today as well. As an educational tool, the framework of interstellar message design provides a lens through which to view cultural diversity. Imagining about what we might say to an extraterrestrial being helps us to realize how much of our language depends upon culture; and the exercise of constructing a message for interstellar transmission helps us to identify knowledge that is common to humanity. Actively broadcasting also has its benefits, even at a low power level comparable with Earth’s leakage, as this provides practice in the general management of long-term continuous projects. All METI experiments to date have been short in duration and have not been repeated. Even if extraterrestrial astronomers do notice one of these signals, they will be unable to verify its presence from a repeat observation and may therefore discount it as noise. The most important feature for a METI transmitter is to be a sustained, continuous source that maintains operation across generations. Humanity needs practice at intergenerational projects, and METI could be a means toward this goal. In 2013, the Lone Signal METI project transmitted a crowdsourced stream in tandem with a Lincos-inspired computational message toward the red dwarf star Gliese 526. I served as the chief science officer of the project and worked with our programmers, engineers, and marketers to develop a website that would collect texts and images from the public and queue them for transmission through the 30-meter Jamesburg Earth Station in Carmel Valley, Calif. The goal of this project was to transmit an authentic METI signal toward a nearby star system with the potential to harbor habitable planets. With the transmission’s destination just over 17 light-years away, the time for the signal to reach its goal is short enough that we could hope for a reply within our lifetime. This effort at public engagement also sought to profit by selling additional messages in the public feed beyond each person’s free allotment. Ideally, this crowdfunded model would be sufficient to sustain the METI beacon and create the first long-term intentional signal intended for interstellar communication. Initial investment in this venture came from the New York City fashion photography industry, which sustained the project until its launch. However, the website failed to attract enough paying visitors, despite an abundance of press coverage and popular interest, and the transmission was sent only once before the project closed up shop for good. Some of the failures of this project were internal: Poor project management, lack of strong leadership, and scant funding can be detrimental to any business. Perhaps a greater lesson from the termination of Lone Signal is the need for broad community support well in advance of transmission, along with secured funding that can be sustained for the duration of a long-term project such as METI. METI may seem like a lofty and unlikely goal, but the prospect of not engaging in METI raises a troubling question: What if everyone is listening and no one is transmitting? Excessive paranoia could lead to a sad state of affairs where the galaxy is populated by numerous intelligent civilizations, all of whom are afraid to talk to one another. SETI also might not be finding anything due to technological asymmetry: Perhaps advanced societies outgrow the need to use electromagnetic waves for communication, so they have no reason to transmit at all. Perhaps they simply find us uninteresting, much in the same way we often regard ants, and they see no reason to initiate conversation with us. In any of these cases, the onus falls on us to break the silence and see who will respond. Let us therefore shout in the desert of space toward the places most likely to hear us. As we peer into the atmospheres of nearby extrasolar planets for signs of life, let us extend our voice across the void by sending a signal from our world. We cannot let fear transfix us to inaction, for this is the surest path toward remaining alone. We must instead seize upon this unique moment in our technological history to make ourselves heard and discover who else has been too afraid to shout.